To make the dressing, combine all of the ingredients together in a food processor or blender, and pulse until smooth. Chill the dressing while making the salad. To cook the shrimp, heat a large skillet over medium-high heat. Season the shrimp with salt and black pepper, to taste. Add the oil and the shrimp, cooking for about 30 seconds. Flip all the shrimp and cook an additional 30 seconds on the other side, until pink and set aside until ready to use. To assemble the salad, toss the lettuce, 2 tablespoons of the cheese, the tomatoes, pine nuts, cooked shrimp, and dressing all together. 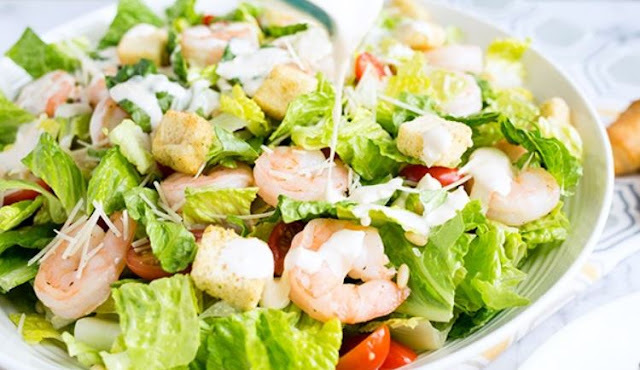 Sprinkle the top with the croutons and ¼ cup Parmesan cheese.